Since I'm working on a lot of my own designs lately, I haven't had very much time to work on other people's patterns. I do try to make time every once in a while, though, and knit something that isn't "work"! After many months, my Wispy Cardigan is finally finished. If you're familiar with the pattern, you will notice I made several modifications, like removing the ribbing from the sleeves and bottom. 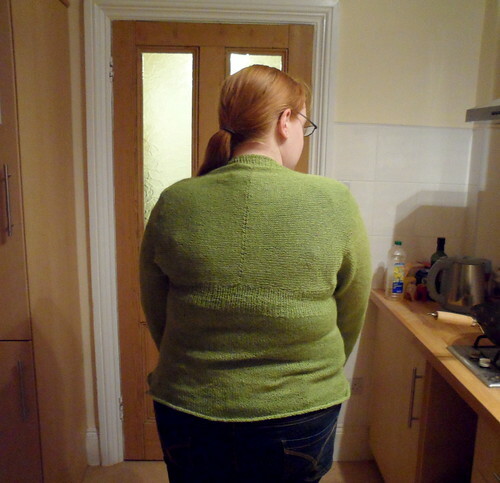 Basically, I liked the original Whisper Cardigan from Interweave, bought the Wispy pattern from the designer, and modified it to look more like Whisper. ;) I'm extremely happy with the result. The yarn is Valley Yarns 2/14 Alpaca Silk, which comes on 8-ounce cones, in the color Nile Green. It's lovely yarn, though a bit splitty - but soft with a nice sheen, and it has exactly the wonderful drape I was looking for in this project. I have a ton of yarn left on the cone, well over 100 grams! Believe me, I never would have thought I could knit myself a sweater with 150g of yarn. But it's true! I'm not much of a sweater-knitting person, and anyone who has seen me at knitting group working on this cardigan has heard me whinging about the miles and miles of stockinette. 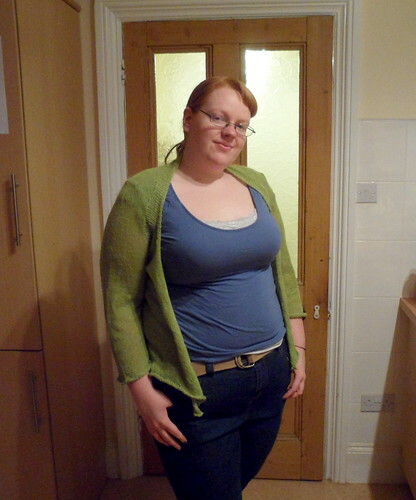 But, I think this is going to be a very wearable cardigan, so it's worth it!